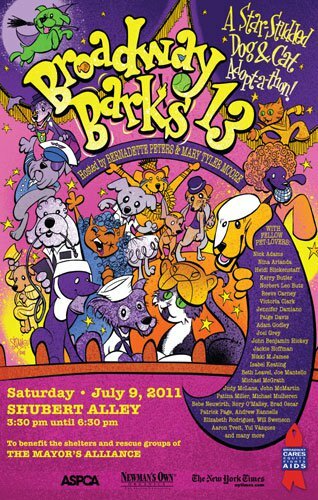 Broadway Barks is this Saturday, 09 July. Scheduled to present the dogs and cats from New York City animal shelters are the following Broadway performers: Sutton Foster, Edie Falco, Victoria Clark, Heidi Blickenstaff, Yul Vazquez, Jackie Hoffman, Nikki M. James, Michael McGrath, Patina Miller, Michael Mulheren, Brad Oscar, Andrew Rannells, Norbert Leo Butz, Bobby Cannavale, Will Swenson, and Joel Grey. The adopt-a-thon will be held from 3:30 to 6:30 PM.